I couldn’t imagine celebrating Easter without baking something typical and wonderful from Italy. 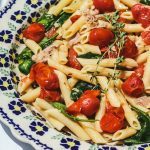 I would rather be in Italy eating something typical and wonderful. 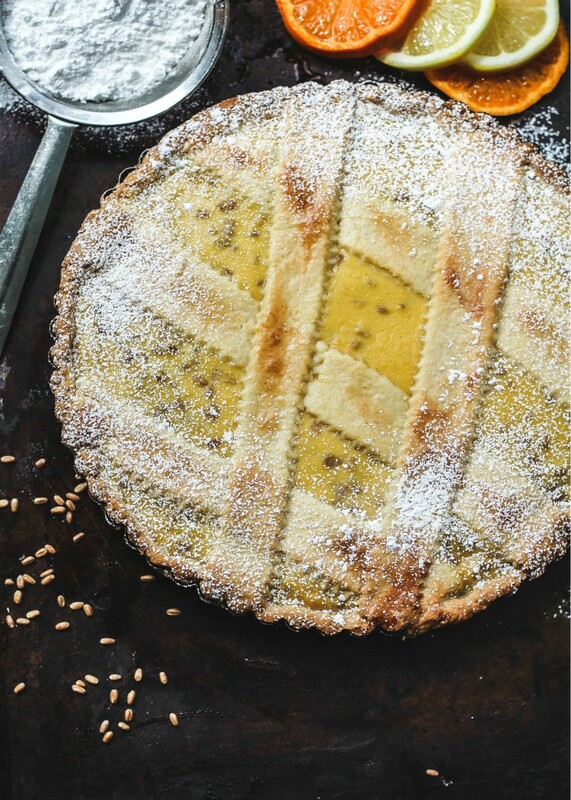 And this Pastiera Napoletana-Italian Easter Pie is something special that you shouldn’t be intimidated to make. 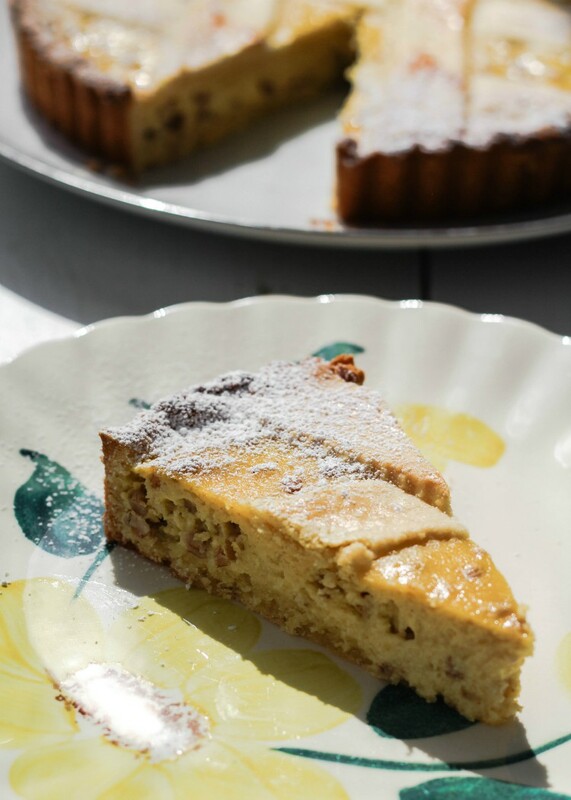 Pastiera Napoletana is a traditional Easter dessert made in Naples and throughout the region of Campania. Some families may bake even up to 6 of these to share with family or friends that come over to visit on Easter weekend. Six! It is so delicious that I could understand why they would bake that many. They even take these on their picnics they have on Pasquetta (Easter Monday). You may have heard Pastiera Napoletana called Pizza di Grano (grain pie), as that is how Italian Americans also call it. It does take a while to make one. It is a tart filled with wheat berries, ricotta and is scented with orange flour water. I know that some bakers do add crema pasticciera (pastry cream) and this is the way I chose to make my pastiera. I also added lemon and orange zest. The more zest the better as it enhances the citrus flavor! I highly recommend adding the pastry cream. It adds a whole different dimension to the ricotta. It makes it truly creamy and dreamy. Every ingredient in the pastiera recipe is symbolic. I know you may be shaking your head wondering, “cooked grains in my pie?”. Trust me…it is wonderful. If you are going to make this, don’t cut out this part of the recipe. Since there are a few components to this incredible Easter pie, it’s best to plan some of them one to two days ahead. 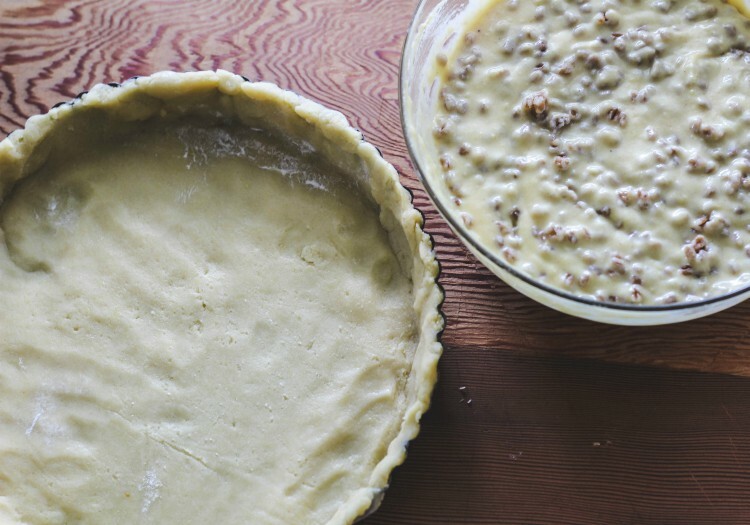 You could make the pastry the day before or even two days before. I make the pasta frolla (pastry dough) in my food processor. You could make the whole thing by hand if you prefer. It’s so easy to put together in the food processor. Once it’s ready, you wrap with plastic wrap and let it chill in the fridge. The next thing to do is make the pastry cream and cook the wheat berries. You could even cook the wheat berries in a rice steamer to make it really easy. I cooked it on the stove as I wanted to check it and make sure it’s not overly cooked and mushy. Once the pastry cream is ready, you mix it together with the eggs, ricotta and other filling ingredients. When the wheat berries are cooked, let them cool down and then fold them into the ricotta mixture. Roll out your pastry dough and place in your fluted tart pan. Spoon the filling into the pan. Spoon the filling into the pastry dough. Roll out the second portion of pastry dough and cut out your strips. Place the strips on top and place the tart on a baking sheet. Bake for 30-40 minutes. Slightly updated post from 2012 (yes, I shared this here 7 years ago!! )I kept these two photos in the post so you can get a good look at the inside of the pie and my little chef busy helping me! My little chef still likes to give his mamma a hand when we bake. It is suggested that you use white wheat berries that you can find in a health food store as they cook up pretty fast. I found at Whole Foods Market the red winter whole grain wheat berries from Nature’s Earthly Choice. It took probably about 20 minutes to cook up. You do want the berries to still have a chewy texture. If they are mushy, it is not the same. I know the unhulled darker berries take a very long time to cook up. You could also substitute the wheat berries with cooked barley or short-grained rice. Pearl barley would be the closest substitute to the wheat berries as it ends up looking very similar to the wheat berries when cooked up. A sweet buttery tart filled with a creamy filling that is not overly sweet. The pastry cream and ricotta together makes it almost like a cheesecake but not quite. I know that the first time I made a pastiera I thought the kids would not like it. How would they feel about whole cooked grains in a tart? They loved it. It just works mixed with the candied citrus, cinnamon, and vanilla. The delicate orange blossom water is dreamy with the sweet ricotta/pastry cream filling. IF you can’t find candied orange peel and don’t have time to make your own, you could leave it out. 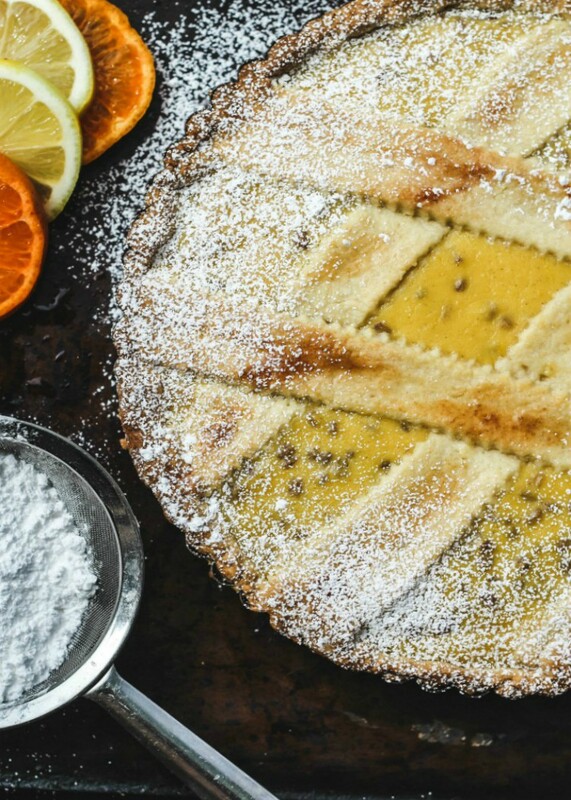 You could add lemon and orange zest instead of the candied orange peels to the filling to give it an extra citrus flavor. When I make it at home for just us I leave out the candied orange peels. The kids aren’t fans of it. The filling sounds heavy but it is actually quite delicate…more delicate than a cheesecake. The most important tip is to make this in steps. I made the dough and the filling the night before. You could even make it a few days before. 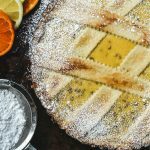 Pastiera Napoletana is a traditional Easter dessert made in Naples and throughout the region of Campania. 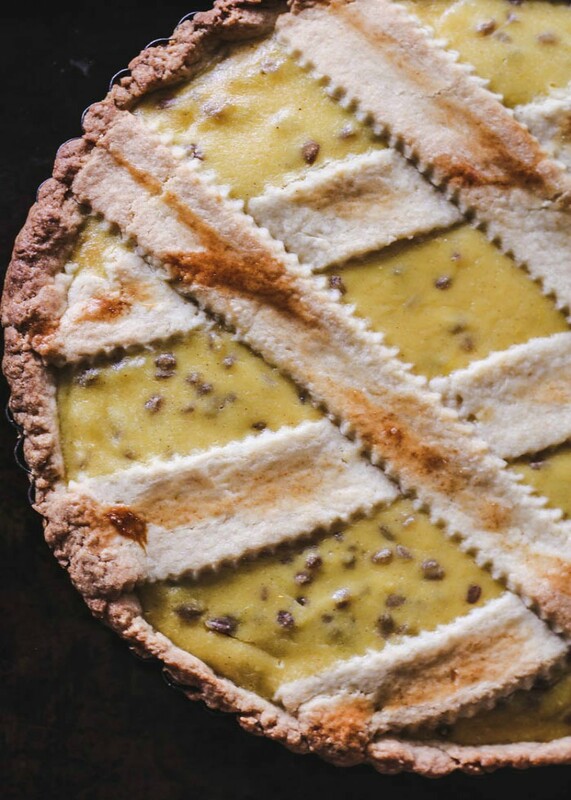 A sweet buttery tart with a creamy filling that is not overly sweet. The pastry cream and ricotta together makes it almost like a cheesecake and totally delicious! In the bowl of a food processor, add the flour and sugar and process a few times to mix together. Next add the butter and pulse a few times until the mixture looks like wet sand. Add the egg and yolk and process a few seconds more until the dough forms (this should be about 5-7 more pulses). Be sure to not overprocess the dough. Dump the dough from the food processor bowl onto a lightly floured counter. Form the dough into 2 disks (one a little larger than the other. The smaller disk will be used to cut the strips for top of pie) and chill in the refrigerator for about an hour. While dough chills, make the wheat berries and pastry cream. Combine the wheat berries with about 2 quarts cold water and the salt. Bring to a boil over medium heat, then decrease the heat to low and allow the wheat to simmer gently until it is cooked though, about an hour. Drain and cool the wheat in a bowl. 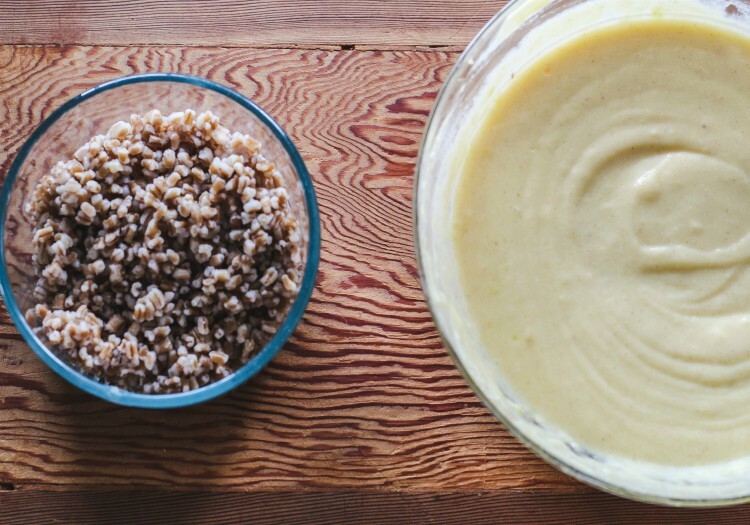 While wheat berries cool down, prepare the pastry cream. Whisk the egg and yolk together in a bowl and whisk in the sugar and flour. Whisk in the milk and scrape the mixture into a small saucepan. Place over medium/low heat and stir constantly until the mixture thickens and comes to a gentle boil. Cook, stirring constantly, for a few seconds after the cream reaches the boil. Scrape the pastry cream into a bowl. Immediately whisk in the ricotta until smooth. Whisk in the sugar, then the eggs one at a time. Stir in the orange flower water, candied orange peel, vanilla, cinnamon and the wheat berries. When dough is nicely chilled, remove from the refrigerator. Roll out the dough between 2 sheets of plastic wrap into a 13-inch round about 1/8 thick. Spray an 11-inch fluted tart pan with removable bottom with baking spray. Gently wrap the dough over the rolling pin and place it over the tart pan; release the rolling pin and let the dough fall into the tart pan. Press the dough softly into the bottom of the tart pan. 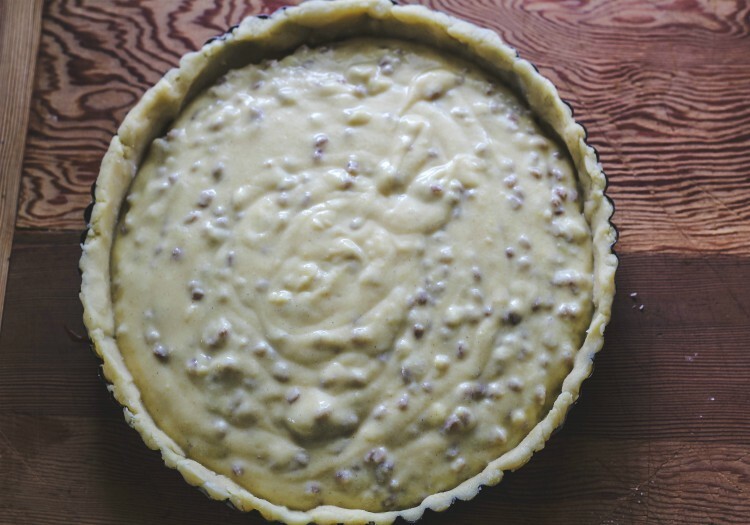 If some of the dough breaks while you press it into the tart pan, that's not a problem. Simply piece the dough together. Press the sides of the dough about 1/2 inch up the side of the tart pan. The rim of the tart should be lined with a slightly thicker layer of pastry than the bottom (about 1/4-inch thick). Cut off the extra dough from the sides and keep these excess pieces to make the lattice topping. Place this tart pan in the refrigerator for about 30 minutes (or even longer if necessary) to chill. When the dough is chilled and ready to fill, remove the tart pan from the refrigerator and prick the pastry bottom with a fork a few times. Set a rack in the lowest level of the oven and preheat to 350 F.
Spoon the ricotta filling into the prepared crust. 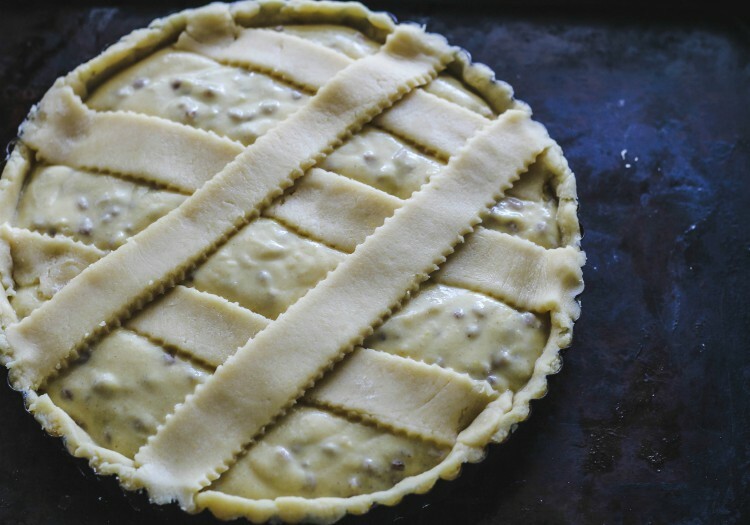 Remove the other portion of chilled dough from the refrigerator to make the lattice strips. Use a serrated cutting wheel to cut it into 3/4-inch wide strips. Arrange 5 of the strips parallel and equal distance from each other on the filling, letting the excess dough hang over the edge of the pie. Place the 5 remaining strips on exactly the same way, but at a 45-degree angle to the first ones. Gently press the ends of the strips to adhere to the edge of the bottom crust. Carefully remove any excess pieces of dough with your fingers or with the back of a knife. Bake the pastiera until the filling is set and slightly puffed and the crust is baked through, about 40 minutes. Cool on a rack. Storage: Keep the pastiera at a cool room temperature on the day it is baked. Wrap and refrigerate leftovers. Bring to room temperature before serving again. This is such a lovely pie! In fact, I have some wheat berries in my cabinet that have just been chilling there. I think I may have found the perfect recipe for them! You know I love all your creations but you just killed me now with this one. Pastry cream and wheat berries?! I would commit a felony for this one! You can't even imgaine, well maybe you can, cause' you now know my voice intonation and all how crazed I am about pastry cream and especially those berries though I never had them in a dessert form, but I can totally c it! I've seen this on a few blogs now, and it looks fantastic. Next Easter, I'll give this a try 🙂 Lovely photos! I'd love this…so unlike anything I've ever eaten, yet tempting with wheatberry/pastry cream filling! 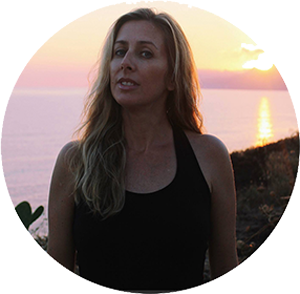 I look forward to seeing what you bake for the holidays, Lora…always an amazing dish! This is the second post I've read this week that has wheat berries in the recipe. I'm only just hearing of wheat berries because of you and Brenda at A Farm Girl's Dabbles. She made a gorgeous salad and you and your little baker boy made a beautiful Easter Pie! Thanks for sharing. Love how you used the wheat berries in this – yum! You are always introducing me to the most unique (and beautiful) Italian desserts. I can't wait to try this. I hope you have a wonderful weekend, my friend. You deserve days of laughter, eating, and friendship! I thought I had commented on this already for some reason. Probably because I was thinking about it so much! I could eat pastry cream like pudding, and to add wheat berries to it is unique and a bit of 'healthy' within each bite. Plus, it's beautiful, like all of your creations! 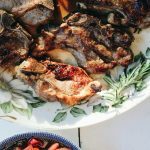 Your all recipes on this blog are really awesome to make just as this one…your Easter pie came out really well when I prepared it last week at a casual dinner of my family…awesome recipes!! This looks incredible! Can’t wait to make one this weekend! WOW!! This pie is absolutely amazing!! Perfect for Easter! Love this idea for Easter! So, so delicious! 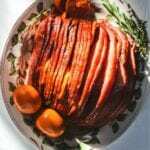 This sounds delicious and is unlike anything I’ve ever made for Easter! I’ll have to give this a try! So pretty! I wish I had a slice right now! This is so pretty! Love the recipe too!